A good eye make up remover makes all the difference come bed time. One that doesn’t pull on your eyes and doesn’t require much effort to remove make up is always best. 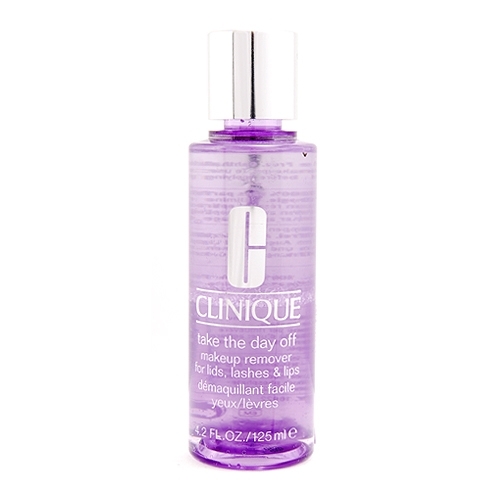 I was excited to try the Clinique Take Off The Day make up remover when I received a sample in a gift with purchase a while ago. The formula requires you to shake the bottle to mix up the top layer of oil and the bottom layer of…. not sure, and then saturate a cotton pad. I’ve tried one of these types of “need to shake” formulations before in the Garner Clean Sensitive 2in1 Waterproof Make Up Remover and I wasn’t totally impressed. Unfortunately, I also wasn’t totally impressed with the Clinique make up remover. I find that I need to use quite a lot of the liquid to remove my mascara and eyeliner, but in the end it does get it off fairly cleanly. I like to try and use less liquid to get value for money personally. For the price that you would pay for this in store ($35! ), I would recommend using a cheaper option that would do the same, or a better job to save money. I quite like the value and quality of the Body Shop Eye Make up Remover with chamomile or the Nivea Daily Essentials Extra Gentle Eye Make-Up Remover. What eye make up remover do you love? Leave me a comment!